This issue of #LEARNABOUT features a unique vegetable that many people have not heard about: water spinach! Water spinach is spinach that grows in water, right? Actually, not quite. Water spinach (Ipomoea aquatica) is biologically unrelated to spinach. But, the name comes from the texture and mild taste of its leaves that resemble those of spinach. Water spinach belongs to the plant family Convolvulaceae, which means "bindweed" in Latin. Two common features you can use to identify plants from the Convolvulaceae family are: (1) all of its plants grow in forms of tender shoots or vines, and (2) if you snip the stems/shoots/vines, a white, milky liquid tends to run out of them. Morning glories and sweet potatoes also belong to the Convolvulaceae family, if you say that you will never believed that sweet potato is "a type of morning glory", here are the flowers of water spinach, morning glory and sweet potato in order (to blow your mind). And just like how water spinach is biologically unrelated to spinach, sweet potatoes are also biologically unrelated to potatoes. So the next time when you encounter a "morning glory"-looking plant growing wild, think twice before you decide that it's just a morning glory bush. Also do try snapping the vines with your fingers. You'll see the white, milky fluid running out of them. Here's another picture of sweet potato vines/greens sitting next to water spinach at a farmer's market. 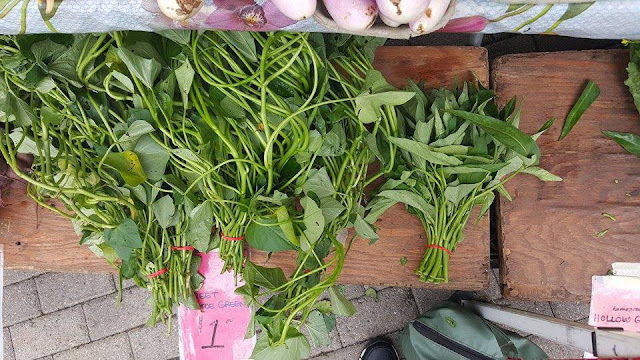 Water spinach can be spotted in the supermarkets and farmer's markets from one distinguishable characteristic: the stem/shoot/vine is hollow in the center. This is the reason as to why the Chinese call it a "hollow-centered" vegetable, and you might also find them under the name "hollow greens", or "kang kong". Lastly, water spinach is a very resilient plant and grows easily like weeds (consider how it earned itself an undeserved title of Class A "noxious weed" in the state of Florida). Adventitious roots that branch from nodes on the stems/shoots/vines of water spinach (or, the plant family Convolvulaceae in general) make planting extremely easy. You simply cut a chunk of the stem with some roots and stick it in soil (or a water/soil mixture). Voila, you'll get yourself a water spinach bushel in no time! What is so special about water spinach? 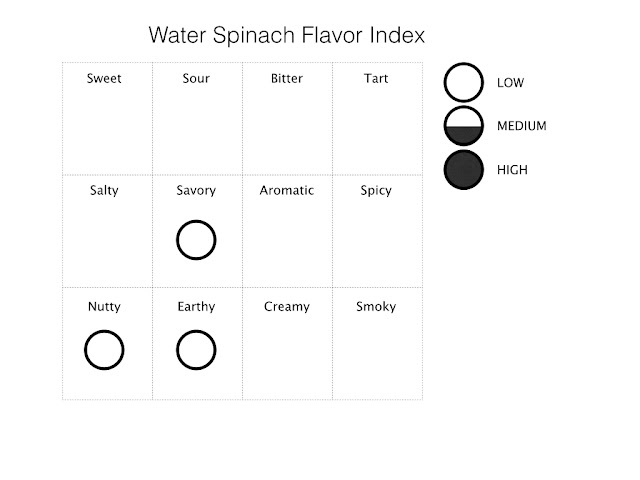 We can compare the taste and texture of water spinach to that of spinach. Water spinach is similar yet milder than spinach. Its leaves are smooth and soft like spinach, and the stems are chunky like bamboo shoots. This makes water spinach a tad more interesting to eat because it has multiple textures. As you can see from these nutrition labels, water spinach is much richer in Vitamin A, C, magnesium, dietary fiber, and protein than spinach; while having a comparable amount of iron, Vitamin B-6, calcium, and potassium. So, when you consider making your next spinach dip or soup, give water spinach a shot instead! Your best bet to finding water spinach is at your local farmer's or Asian market, as it is commonly used in Asian dishes. Upon buying it, make sure to take home two or three bushels at a time. Like spinach, the volume of the leaves drastically shrinks when cooked. One bushel usually makes a side dish for 2 people. While cooking, break the long stems/shoots/vines into thirds or quarters. This makes eating them much easier. It goes well with everything spinach goes well with, like tomatoes, mushrooms, artichokes, eggs, etc. It doesn't go well in salads (because of its milder taste and variable texture). Try not to overcook it. Water spinach is cooked when it turns vibrant green. If overcooked, the leaves turn into a yellow-green sludge, and the stems lose their integrity/texture.